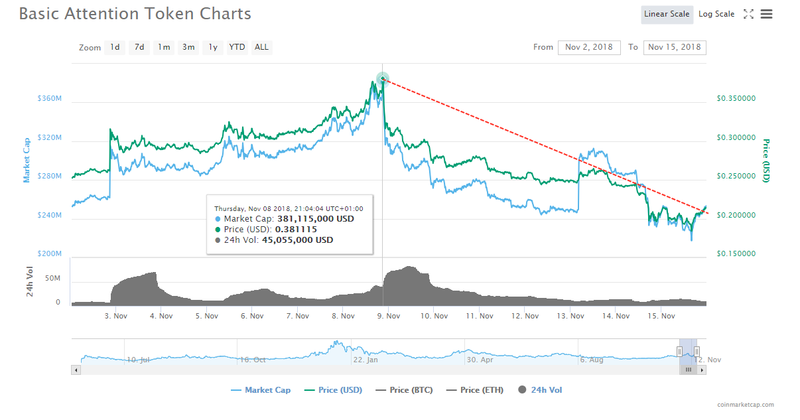 Following Bitcoin’s BTC last value plunge against the US Dollar, altcoins as traditionally acted similar to the leader’s performance and dived below major important levels which were supporting the prices for months now. Per time of writing, the pair XRP is one of the only in the green out of the leading coins after its latest movements have raised questions if Ethereum is losing its second position by market capitalization to XRP once and for all. However, two coins which are taking center-stage very often lately: DogeCoin and BAT or Basic Attention Token, are welcoming a positive increase of 4.05% and 2.15% against the USD in the last 24-hours. With the move, both virtual assets are changing hands above the weekly declining trend that has taken over the market. BAT has been designed to bring efficiency in the marketing and advertising industry. The digital token, BAT is exchangeable among publishers, advertisers as well as users. With the attempt to clear fraud, trackers and middlemen, the blockchain adoption in the marketing industry including similar projects to BAT which are being developed is rising on a higher scale day by day. Following Coinbase’s listing of BAT on Coinbase Pro, after being teased in the summer that the leading cryptocurrency exchanging platform is experimenting around with a few of the leading digital assets, Circle Invest declared that it is adding BAT. Salt Lending platform has announced that it is listing DOGE under collateral for loans via a medium post that was posted also on their official twitter handle.